Would you like to add our green 2-Sided Block Mats, Lego® on one side, Duplo on the other side? Otherwise, this table for $179 will come with just the white multi-use table top. Each baseplate is 12″ x 32″. They simply drop into the raised border of our tables. Easy to clean baseplates since you can remove them, wash them! Made to last for generations! “Buy once, Buy right, Buy Nilo®”! With Holes in Framing: The original reason for the holes was to hammer in Nails and construct off of the table with a toy called Brio-Mec. Our N99s Slide Hammer ’N Nails allows you to Hit the Nails INTO the table and then Hit them OUT of the table thanks to our dual purpose Slide Hammer design. The holes also interact with our Nilo-Jax (Extreme trestle set great for wooden trains and other track sets), Rok-Jax (Rokenbok use) and our Nails also work with Zoob (a construction toy), Fiddlestix and other toy uses! 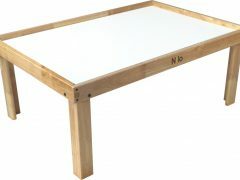 So if you want to add value to your Nilo table you may want to consider our #1 selling N51 (large full size) table or our N34 (half size table). Just select your Finish! 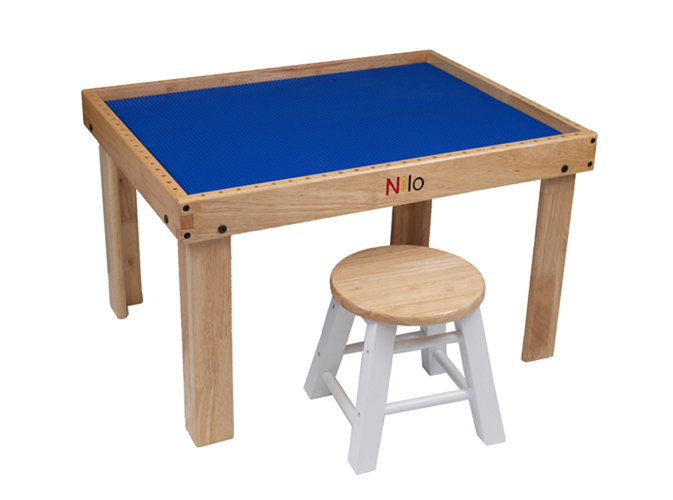 There are many reasons why Nilo® is the leader in activity tables, Lego tables, Duplo tables, wooden train tables, basically multi-use tables for children. We’ve been selling our incredible tables since 1992! This is our 25th Year Anniversary! Lets just get right into it! 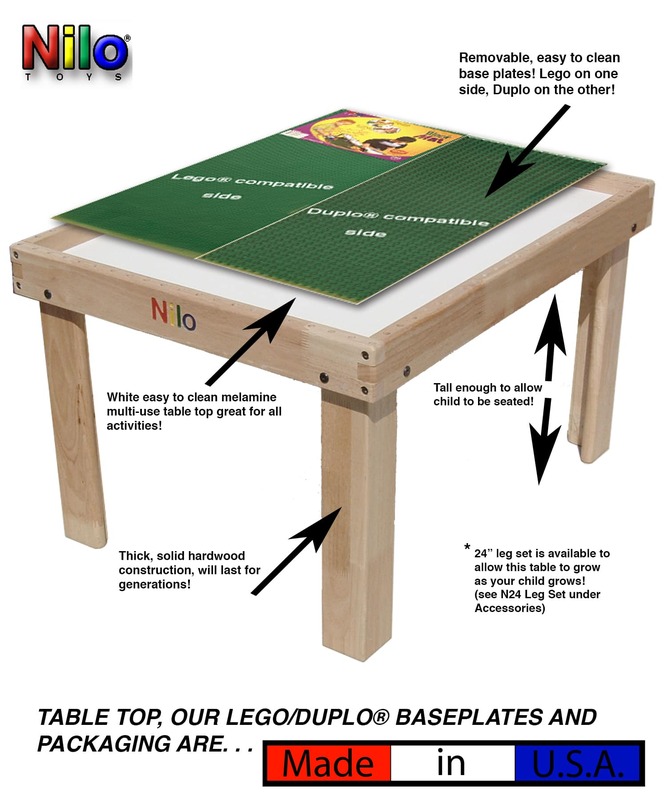 This table does not include our N65s Graphic Play Mat. 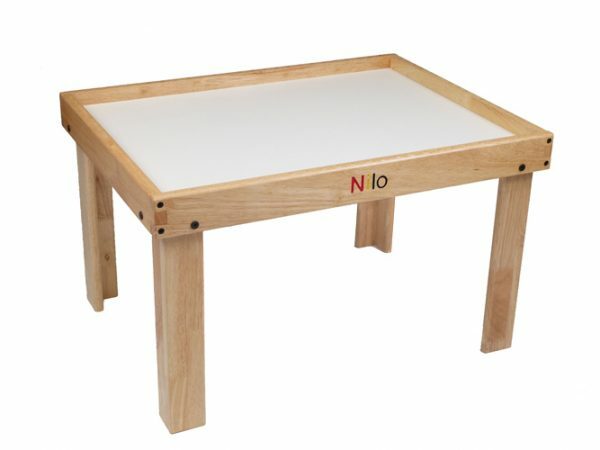 See the mat here: https://nilotoys.com/product/n65s-nilo-graphic-play-mat/ If you desire this mat, please order our N51GN table instead. I purchased the small table with holes for my grandchildren to play with when they visit. They were age 1 and 3 but now are 2 and 4. They both love sitting or standing at the table. Endless hours are spent designing with Leggo’s or Duplo’s. Additionally they use their wooden train sets on the table, and complete puzzles. The table is wonderful for containing toys and arts and crafts projects. The peg holes are terrific for adding “fences” and other creative structures they think of. My grandchildren spend hours at the table and still looks like new. I am so glad I purchased leg extenders so the table can grow with them! We took our time to find the perfect play table and this is it! Well built. Diplomats mats are great and easy to remove. My kids spend a lot of time at this table. A high quality item that doesn’t look like “kid stuff” in the family room. This product is of great quality!! I am very happy with this Lego table !! I purchased this for my grandson’s second birthday. He is now 7 and has a sister that is 5. The hours spent at this table are immeasurable. Besides Legos/Duplos, they use it for trains, cars, Calico Critter houses, tea parties, and so on. I got 3 chairs so there was always an extra for a friend (or stuffed animal) to join them. It was easy to assemble and is the most durable I’ve seen. This is definitely something they will be using with their own children. 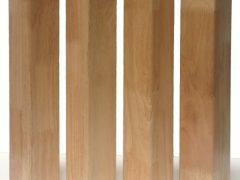 I was looking for a replacement for a Brio table, which had holes for pounding in pegs, plus other table top activities. However, the Brio table was no longer made and difficult to find. This turned out to be a fortunate turn of events, as my search led me to the Nilo web site. The N34 table with holes was not only a perfect replacement, but is a far more sturdy and well-built activity table than the original Brio table! My three young grandsons have pounded to their hearts content, and the table is still in great shape. They have also used the table top for various Lego setups. Another great benefit is the availability of the longer leg set, which will be replacing the shorter legs in the next year as the kids are getting taller. 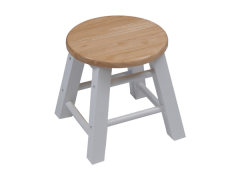 Nilo definitely knows their young customers, and has geared their high-quality products to meet every possible need – smooth hard wood, non-toxic finishes, and perfect sizing. Extremely pleased with my purchased! 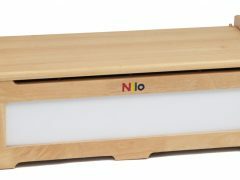 Approximately 12 years ago, we purchased our NILO table and the storage bin. My 2 older children have long since outgrown it and my youngest is about to outgrow it. Both items still remain in the household, as sturdy as the day they were shipped to us. Both items survived 3 children, their friends, and a few dogs jumping up to steal a snack. The table had many uses- it was an art table, a homework table, a Saturday morning cereal eating table. Of course, the white top has a few stains on it, signs of use after 12 years. However, it did its purpose above and beyond what we intended it to do. The table is in many pictures of my children growing up. If you are in the fence about investing in a NILO, don’t be- it will last! You will get your money’s worth!